This is a superb Hand Signed Colour 10" x 8" photo by the jockey who rode " Synchronised " to victory in the 2012 Gold Cup and had the sadness of seeing the horse put down after falling in the Grand National. 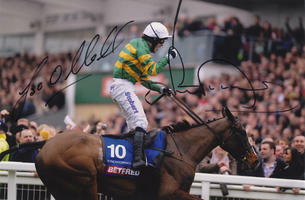 Also signed by the Trainer Jonjo O'Neill. Jonjo O'Neill (born 13 April 1952) is an Irish National Hunt racehorse trainer and former jockey. He is a native of Castletownroche, County Cork in Ireland. Based at the Jackdaws Castle training establishment in England. O'Neill twice won the British Champion Jockey title and won the Cheltenham Gold Cup on the mare, Dawn Run who became the only horse to complete the double of winning the Champion Hurdle and the Gold Cup at the Cheltenham Festival. At the 2009 Cheltenham Festival, Wichita Lineman, an O'Neill trained horse, won the William Hill Trophy. On 10 April 2010, Jonjo O'Neill trained Don't Push It to win the Grand National. In seven attempts as a jockey he had never completed the course but Don't Push It, ridden by the champion jockey Tony McCoy (whose best finishes in fourteen previous attempts had been third places) overtook Black Apalachi at the last fence and pulled clear on the run in to win by five lengths. In March 2012 he trained Synchronised to win the Cheltenham Gold Cup.